The Old Forest needs YOU! Won't you be our Valentine? Old Forest State Natural Area? Yes, we can! I was serving as superintendent of Shelby Farms Park when the forest along the Wolf River was designated as the Lucius Burch State Natural Area in 1988. The effect of that designation was to provide Shelby County with support from the state of Tennessee. It also attracted citizen support that we had never experienced before the designation. We experienced no downside at all. The Old Forest of Overton Park deserves no less than this level of protection, so that it may be forever green. The Old Forest in Overton Park is a very important asset to our city. There in the middle of town, with high-rises, universities and homes, sits nature at her finest, exactly as Earth made it. Flowers, birds, animals, all have a home there, but, they will welcome us if we do not harm it. There is no need to pack the car, use gas to drive miles to "get one with nature." It is right around the corner. 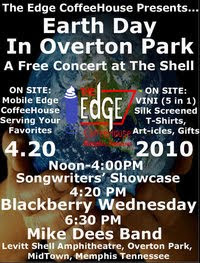 Years ago when society tried to destroy Overton Park and the zoo, those ladies knew what they were doing! Now it is time to protect the Old Forest for future generations. I am vice president of the International Society of Arboriculture, Southern Chapter. I am also on the board of directors of the West Tennessee Urban Forestry Group. I am sure I speak for these groups as a whole when I say that the Old Forest in Overton Park would benefit the most as a state natural area that would remain undisturbed other than for education and enjoyment by the citizens of Shelby County and by visitors from other areas of the world. Our Old Forest is rare and should be respected as such. Opponents of the proposed Old Forest State Natural Area would likely prefer that Google Maps hurry up and replace the current satellite image of Overton Park. Zoom in a bit and you can easily count more than 200 vehicles parked on Overton Park's classic greensward, the park's only expanse of open grass where non-golfers are allowed. This overflow of zoo parking spreads across half the field and over the roots of dozens of periphery trees, while the zoo's Galloway Avenue parking lot sits two-thirds empty. The greensward is not fallow land, either; you can spot a dozen picnic blankets in the photo, with plenty of people milling about the open space. 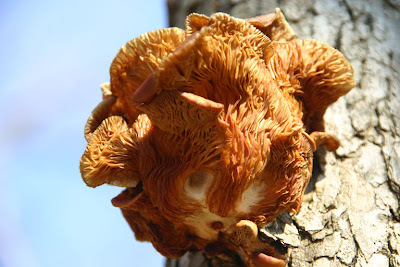 What does this have to do with the park's 10,000-year-old Old Forest Arboretum? The same group of people are "taking care" of both recreational amenities with the same managerial mindset. I agree that overlaying a state natural area designation on part of the park would clutter up an occasional workday for a few civil servants and zoo executives, but so what? 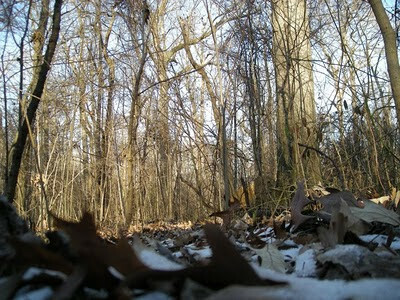 Why should we trust the Old Forest's current stewards to treat it as a "city natural area," given their current neglect? I have no problem with "people in Nashville ... telling us how to manage the park" (Dec. 12 article, "Parties differ on how best to preserve Old Forest"), as long as their management doesn't include more bulldozers and parking cones. Let me get this straight. 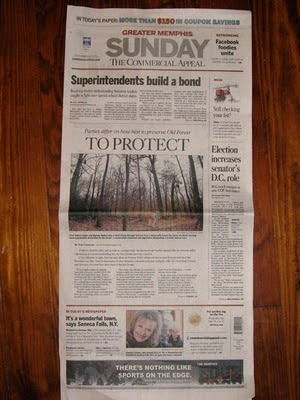 The city wants a conservation easement in Overton Park with oversight by the city (Dec. 12 article) -- the same city that put a maintenance facility in the Old Forest, the same city that almost allowed Interstate 40 through the Old Forest, and the same city that will allow the zoo to cut down old-growth forest to install "an environmentally friendly nature trail" to "really connect children with nature." Talk about the fox in the hen house. I hope those who genuinely care about protecting and preserving the park and the Old Forest will rally behind the idea of a designated Old Forest State Natural Area. If all parties involved claim to have the best interests of Overton Park at heart, why not designate it a state natural area? Why not have the most restrictive protection possible for such a unique and limited treasure? In your Dec. 12 article "To Protect/Parties differ on how best to preserve Old Forest," the zoo and city seem to be saying that having a state natural area would interfere with the city being able to maintain the park/forest and that the state would not be able to accomplish things like ridding the forest of nonnative elements such as honeysuckle. Does the city currently perform such activities in the Old Forest? To say the state doesn't have the manpower to maintain our forest as a state natural area is rather vague, so I'd like to know what resources the city currently provides for park/forest maintenance, so we can compare what the city is doing to what the state would do if it were run by the Tennessee Department of Environment and Conservation. I have visited state natural areas in Tennessee and other states, and I haven't seen any that strike me as "lacking in maintenance" or being overrun with any other problems. The bottom line is this: Give the forest the best (and most) protection possible. It is limited in size -- and has gotten smaller -- and is already firmly established as being used for walking, running, hiking and biking, and has been saved from the interstate once, so what is the problem? It is important, people love it, and their (our) love for it brought it before the U.S. Supreme Court, which shows its relevance as a historic and civic treasure, as well as a natural one. Man, in his infinite wisdom, has, by some miscarriage of reason, placed himself above the natural world. Somehow we feel compelled to make our mark on every square inch of the planet, to manipulate God's creation to suit our own design. As an architect, I spent 20 years of my life contributing to this process, until my disgust for our shortsightedness finally overcame my ego. Luckily for us Midtowners, a tiny patch of the primeval forest that once covered the entire southeastern U.S. was saved from the tidal wave of developmental devastation that continues to roll eastward through Shelby County. If we have any hope of stemming the tide of destruction (which can also be traced via its socioeconomic wake) the fulcrum of the brake lever must be Overton Park. I urge support of an immediate moratorium on any further encroachment upon, and legislation mandating the most restrictive preservation of, what little remains of the old-growth portions of the park. Maybe by working together to save a few trees for our children, we could expand the initiative and redevelop the vast swaths of urban decay left us by our parents. 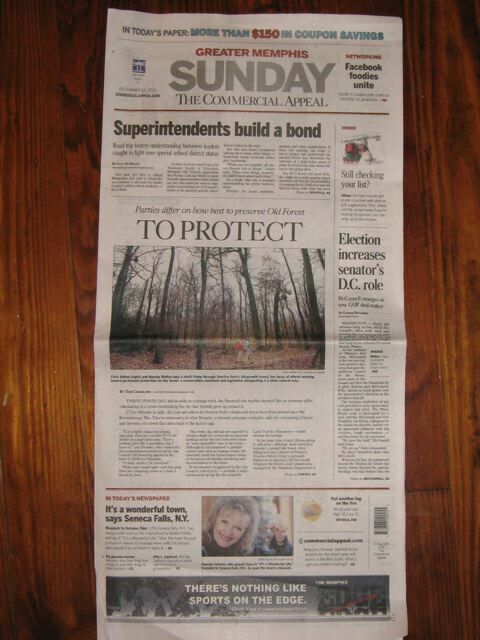 Today's Commercial Appeal has a front-page story about our efforts to protect the Old Forest of Overton Park. Mayor AC Wharton's staff previously told us that he was still considering whether to support the Old Forest State Natural Area this year. It looks like he's decided to oppose it. Our City CAO, George Little, suggests that a conservation easement would be "less burdensome" because it would not place "too many restrictions on park operations." In the past three years alone, the City's routine "park operations" at Overton Park have included activities such as: clearcutting four acres of old growth forest, using the Greensward as a private parking lot, and destroying large swaths of forest understory on several different occasions. And the City still plans to build a stormwater detention structure in the Greensward. The two draft conservation easements that we have received from the City did not offer any meaningful protection for the Old Forest. 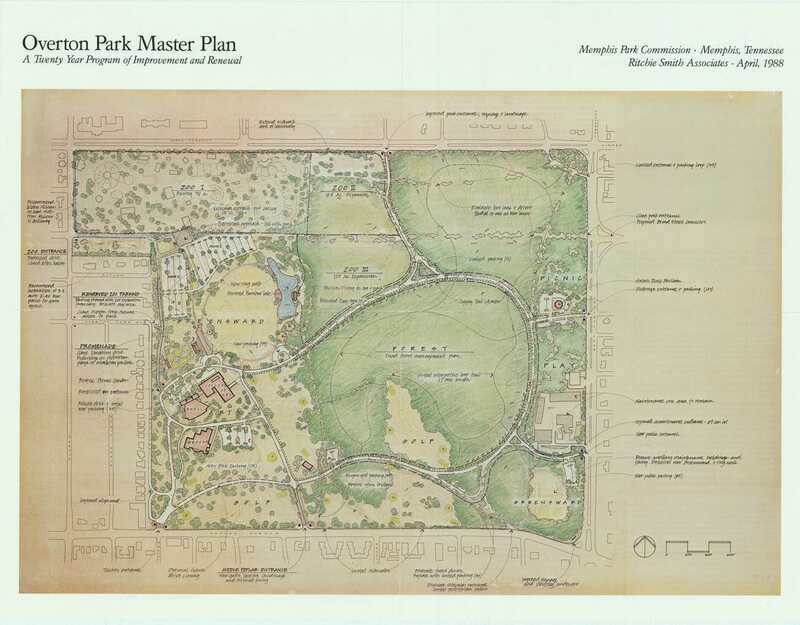 The City told us that both of those documents were written by the Memphis Zoo's CAO, Jim Jalenak, with assistance from Park Friends Inc.
CPOP was not asked to join the Memphis Zoo and PFI in drafting the Overton Park conservation easement. Our public comments on the first draft have been ignored completely for the past eight months. On Thursday, the City told us that CPOP's comments will only be considered after the third draft is written. Mr. Little also says: "We don't think people in Nashville, no matter how well intentioned, should be telling us how to manage the park." But the City just told us that the Nashville-based Land Trust for Tennessee is in charge of writing the third draft of the Overton Park conservation easement. Clearly, it's okay for some people in Nashville to tell us how to manage our park. The Land Trust for Tennessee is a worthy and well-respected land management group, but so is the Tennessee Department of Environment & Conservation. Why is the private group being portrayed as trustworthy while the public group is not? We have said, clearly and repeatedly, that we support the Memphis Zoo's proposal to "follow the Shelby Farms model" of park protection. At Shelby Farms, the forest along the Wolf River became the Lucius Burch State Natural Area in 1988, and the entire park was recently protected by a private conservation easement. These two methods of legal protection are complementary, not mutually exclusive. Here's another great example from this year: In January, the state legislature passed a bill to create the Hill Forest State Natural Area in Nashville. In August, this new State Natural Area was further protected by a private conservation easement held by the Land Trust for Tennessee. This land is now being given to the City of Nashville and added to the Warner Parks system. We think this is a perfect model for protecting the Old Forest and the other public spaces of Overton Park. It's obvious that the City of Nashville does not think State Natural Area designation poses any threat to their ability to manage their own parkland. Why should this be any different for the City of Memphis? We hope the third draft of the City's conservation easement will offer real protection for Overton Park's public spaces and the ecological integrity of the Old Forest, and we strongly believe that the Old Forest State Natural Area is necessary. How can you help? Contact Mayor Wharton by email or by phone at 901-576-6000. Tell him you stand with CPOP in support of the Old Forest State Natural Area and meaningful legal protection for all of Overton Park. 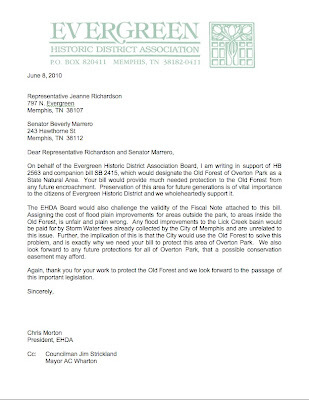 You can also write a letter to the editor to help advocate for the highest level of protection for Overton Park. If your civic group or business would like to join this coalition, please let us know. 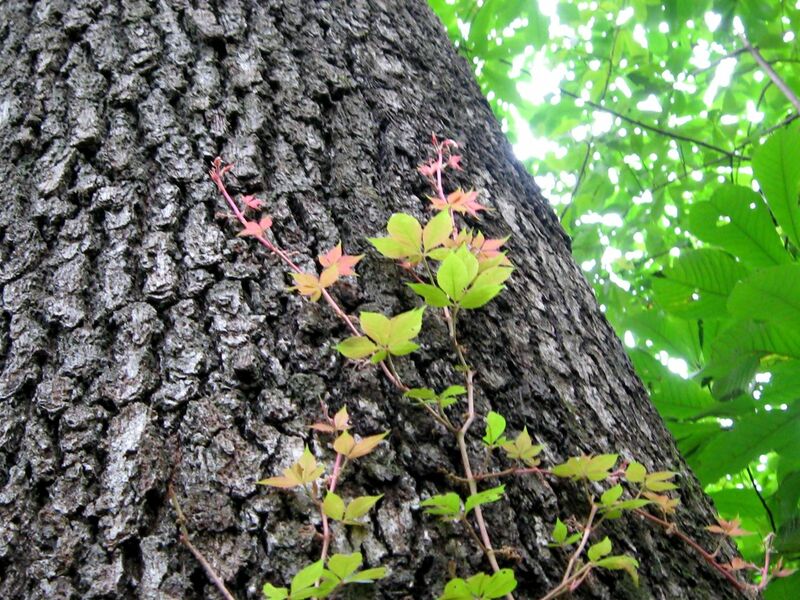 Memphis' historic "Old Forest" needs permanent protection. 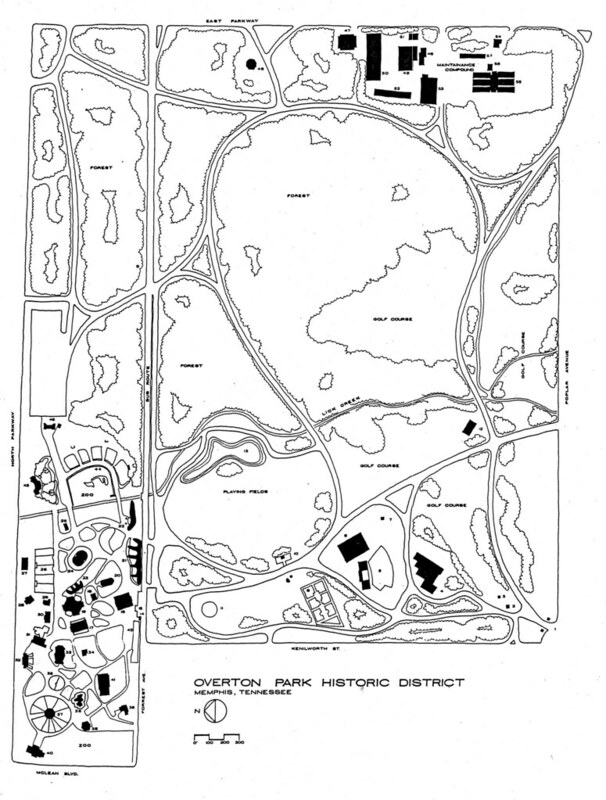 Nearly 40 years ago, the original Citizens to Preserve Overton Park (CPOP) won a U.S. Supreme Court ruling that blocked the extension of Interstate 40 through Overton Park and a large swath of Midtown. Our community owes a great debt to this small group of citizens who fought so doggedly to protect our park and our neighborhoods. But are we honoring their legacy? It's easy to assume that Overton Park is safe from harm. There are even a few laws to protect our city parks, like Section 12-84-2 of the Memphis Code of Ordinances: "It is unlawful for any person to cut, break or in any way injure or deface any tree, plant, or grass, or pick any flowers, leaves or nuts, wild or cultivated, in any park." And yet, the Memphis Zoo clear-cut four acres of Overton Park's old-growth forest in early 2008 because our city's Park Services division quietly approved it. When were citizens told about this plan to destroy publicly owned parkland? We had to figure it out for ourselves, early one Saturday morning, when chainsaws and bulldozers arrived to churn a priceless ecosystem into mud. Last year, a city-funded botanical study found a rich array of more than 330 plant species in Overton Park and defined the forest as "an extremely rare virgin or old-growth forest" that almost certainly began growing when the last ice age retreated 10,000 to 12,000 years ago. That study concluded: "Overton Park's forest is a unique resource which cannot be replaced. It is invaluable to the city and to the region as an outstanding example of old-growth forest. Because it is within an urban setting, it is even more exceptional. Everything possible should be done to assure that it is protected in perpetuity." Despite this strong recommendation, our exceptional forest still lacks any legal protection. Memphians know this forest as the "Old Forest" because it has always been there for us — a beautiful remnant of the big woods that once covered the Fourth Chickasaw Bluff — and it's time we stepped up to protect it. Zoo expansion is just one threat to Overton Park's forest and other public spaces. Too often, our civic leaders treat parkland as if it's disposable. Memphis lags far behind our peer cities in park spending per capita and park acreage per capita, according to the Trust for Public Land. As recently as 2007, Mayor Willie Herenton and several City Council members proposed selling off more than 20 city-owned parks. In the past two years, the city's engineering staff has proposed two different ways to repurpose Overton Park's Greensward for storm-water detention. Last year, Mayor A C Wharton and several City Council members proposed closing our city's oldest golf course because it's not a money-maker. 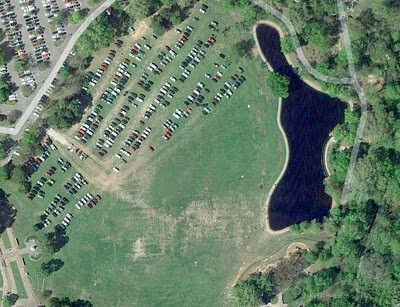 The Memphis Zoo turns half of the Greensward into a private parking lot about 20 times a year. Right now, the city is reviewing plans to convert part of the southeastern corner of Overton Park into an overflow parking lot for the Memphis Zoo. This space is occupied by city facilities — greenhouses, machine shops, storage buildings, offices, and a fuel station — which would need to be torn down and rebuilt elsewhere at great expense. Maybe it's a good idea to relocate these facilities and redevelop the area as free public parkland. But does it make sense to spend our tax dollars to convert this land to a parking lot? Will citizens have any part in this decision? Going by the city's track record, we're likely to find out when the bulldozers arrive. This woeful track record is why we are asking the city of Memphis to endorse the legislative designation of the Old Forest State Natural Area, which would protect Overton Park's 150-acre forest for citizens to enjoy forever. We also support a strong conservation easement to protect the cultural and historical integrity of all 342 acres of Overton Park. And we want all of this to happen with plenty of public input, communication, and transparency. We are joined in this effort by Clean Memphis, Greater Memphis Greenline, Livable Memphis, Memphis Heritage, Mid-South Peace & Justice Center, Project Green Fork, Sierra Club, Skatelife Memphis, and many individual citizens. We hope you'll join us, too. 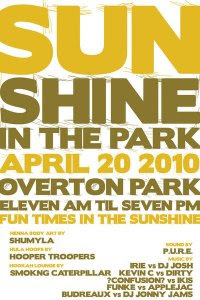 Wouldn't it be rad if Overton Park was connected to Shelby Farms Park? This radiculous concept is taking shape in the form of a bike/ped "artway" that passes from Overton Park through the Broad Avenue Arts District and down Tillman Street to the western terminus of the Shelby Farms Greenline. Livable Memphis spearheaded this project and was awarded a $25k matching grant from the Alliance for Biking & Walking. Now, we need to do our part -- by partying like rock stars. All proceeds will go to help fund this connection. 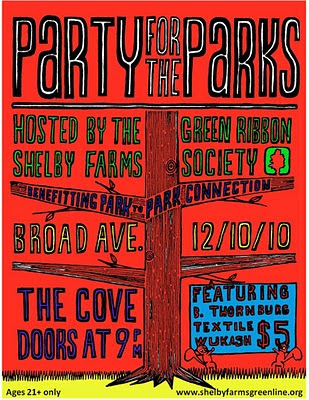 So, come on down to The Cove on Friday, December 10, and get your groove on for connectivity. Doors open at 9PM -- $5 cover. Let's build a better future together. Thanks to the efforts of Councilman Jim Strickland, the City of Memphis has hired an independent consultant, TetraTech, to study flooding and its solutions in the Lick Creek Basin. TetraTech, Mayor Wharton and Councilman Strickland kicked off the study with a public meeting at Snowden Elementary this past Monday to begin gathering public input. CPOP sent the letter below as our official comment. 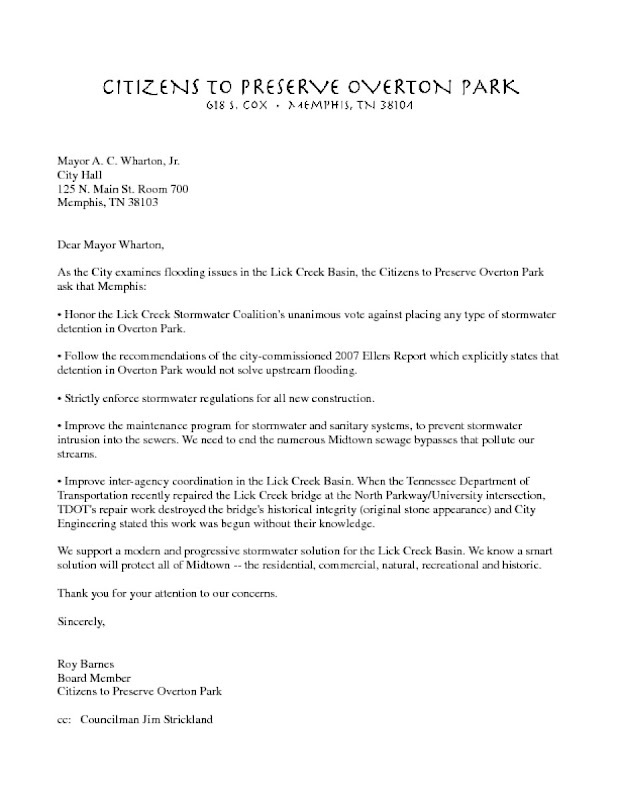 We ask that Forest and Park supporters also weigh in and email the Mayor, Councilman Strickland and TetraTech, asking them to follow the vote of the Lick Creek Coalition and recommendation of the Ellers 2007 engineering report: keep detention out of the Greensward and Overton Park. As you know, CPOP supports the idea of a conservation easement to protect Overton Park from inappropriate uses in the future. We also support a Tennessee State Natural Area designation for the 150-acre Old Forest, because we think it's the simplest, cheapest and most effective method to protect this unique ecosystem. Over the past two years CPOP has frequently stated that the process of giving legal protection to Overton Park should be conducted openly and allow for public participation. Our board of directors met with you and the City's Chief Administrative Officer, George Little, on February 25, 2010, and were given a verbal promise that this would occur. So far you have shown no openness or willingness to include the public in this process. A number of interesting points were raised in today's Commercial Appeal article about moving the General Services maintenance area out of Overton Park. It's great to see Mayor Wharton and CAO George Little affirming their commitment to legal protection for Overton Park's old growth forest. It's also great to see support for viewing the Greensward as a fully developed space for people, which it is, rather than as vacant land. But the idea of spending unknown amounts of money to demolish all of the workshops, garages, greenhouses, offices, a fuel station, and other buildings in the maintenance area... in order to build a parking lot for the Memphis Zoo? That idea needs a lot of work. The Memphis Zoo is proposing to shuttle their visitors, using the zoo's large diesel trams, via interior park roadways that have been closed to motorized traffic since the early 1990s. These roadways are heavily used by park visitors as safe and peaceful routes to walk, run, and bike. Motorized traffic does not belong on the interior roads of Overton Park. We all agree that the Memphis Zoo needs a better way to handle overflow parking. The zoo currently controls nine acres of paved parking in Overton Park. Wouldn't it be much easier and cheaper, and more sustainable, to convert a few acres of an existing lot into a multi-level garage? Or even simpler, the Memphis Zoo could provide traffic control on busy weekends and encourage visitors to make better use of the plentiful street parking in Evergreen. "If there are no plans for wildlife in the Chickasaw Bluff exhibit that would require barriers, the existing fence around the 17 acres should come down and if necessary be replaced with something that preserves a seamless view if not access from the rest of the wooded area. Memphians use the park for different reasons. They are not competing reasons, just different. Today’s visitor to the zoo was yesterday’s jogger and is tomorrow’s art student." Why should we create the Old Forest State Natural Area at Overton Park? Overton Park covers 342 acres of public parkland that is owned by the citizens of Memphis. 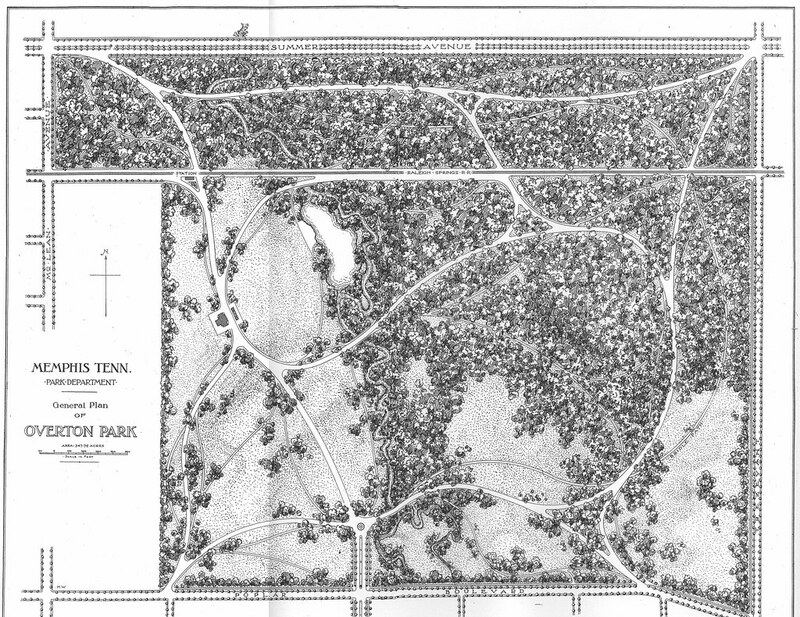 When Overton Park was created in 1901, it had 200 acres of old growth forest. We've since lost 50 acres of that forest. In the past five years alone, our city officials have allowed the destruction of eight acres of this 10,000-year old ecosystem for new exhibits at the Memphis Zoo. Overton Park's old growth forest is a priceless and irreplaceable natural resource, but it is not protected by any law. State Natural Area (SNA) designation by the Tennessee legislature would give this forest the permanent legal protection that it currently lacks. What is a State Natural Area, exactly? What are some examples of Tennessee State Natural Areas? There are currently 80 SNAs in Tennessee [official map]. They range in size from just a few acres to 18,000 acres, and include many well-known parks such as Fall Creek Falls, Cedars of Lebanon, Frozen Head, and Savage Gulf. In west Tennessee, these protected lands include the Lucius Burch State Natural Area at Shelby Farms, the William B. Clark State Natural Area, Riverwoods State Natural Area, the Ghost River State Natural Area, Reelfoot Lake, Sunk Lake, Big Cypress Tree State Natural Area and 11,000 acres of Meeman-Shelby Forest State Park. Where would the Old Forest State Natural Area be located? This map shows the approximate boundary of our proposed Old Forest State Natural Area. It would include all of the remaining old growth forest, which totals about 150 acres. How would this change the way Overton Park's forest is managed? If we create the Old Forest State Natural Area, it would be managed jointly by the City of Memphis and the Tennessee Department of Environment & Conservation (TDEC). Citizens would have the legal right to demand enforcement from TDEC if anyone tried to destroy or degrade the Old Forest. TDEC has the legal right to stop destructive activity and issue fines for violations in SNAs. Designation under this law would also give Overton Park's old growth forest the positive public recognition that this unique natural resource deserves. I've heard some SNAs ban biking and running. Will that happen here? The Lucius Burch State Natural Area at Shelby Farms does ban biking and running, because Shelby County's current management plan specifies those bans. Management plans are developed jointly by the landowner and TDEC, with public input, and can be more restrictive than the law requires. Our group strongly supports all of the recreational activities that are currently allowed in the Old Forest -- walking, running, biking, dog-walking, photography, bird-watching, et cetera. The SNA law and regulations do not prohibit or restrict any of these activities. Most SNAs allow multiple public uses. For example, the 11,000-acre SNA at Meeman-Shelby Forest State Park allows running, biking, hunting, fishing, boating, and many other activities. The Meeman-Shelby SNA was designated in 2002 and there have been no changes in how the park is managed or used by the public. We have no reason to think that the City of Memphis would want to restrict any of the current public uses at Overton Park. The management plan for the Old Forest State Natural Area would be developed in an open public process with citizen input. Why can't we just protect the Old Forest with a conservation easement? The City of Memphis and the leaders of the Memphis Zoo have proposed a private conservation easement to protect the Old Forest. They have cited Shelby Farms as their desired model. Shelby Farms is protected from inappropriate development by a private conservation easement that is exclusively enforced by a Nashville nonprofit, in exchange for a large yearly fee paid by Shelby County. Citizens have no legal right to demand enforcement of this private contract. Most of the forested area inside Shelby Farms, along the Wolf River, was designated as the 728-acre Lucius Burch State Natural Area in 1988. It is also protected by the conservation easement that covers all of Shelby Farms. This particular conservation easement has a term limit of 50 years, at which time the contract may be renewed or not, but the SNA designation is perpetual. Our group supports the idea of a conservation easement to protect all 342 acres of Overton Park. However, it is our position that a private conservation easement alone cannot give sufficient protection to the Old Forest. We have researched both options extensively and have consulted with attorneys who are familiar with the applicable laws. We strongly believe that SNA designation is the simplest, cheapest, strongest, and most publicly transparent method of legal protection for the Old Forest. How much would it cost the City of Memphis? Nothing. The City of Memphis has stated that SNA designation would cost millions of dollars, but this is not the case. For example, earlier this year a new SNA was created adjacent to Warner Park in Nashville to protect an old growth forest known as the Hill Tract. The fiscal note for this legislative bill was zero dollars. This new SNA will be developed with public hiking trails by the City of Nashville parks department. The Old Forest already has well-established hiking trails. At all of the other SNAs in our region, TDEC pays for boundary signs and assists in surveying the property as needed. TDEC often pays for kiosks and trail markers, including staff time for installation, and TDEC staff coordinate public activities such as hikes and cleanups. The City would not be legally required to do anything new at Overton Park, aside from putting an end to the bulldozing of the Old Forest. Would this harm the Memphis Zoo? The creation of the Old Forest State Natural Area would not harm the Memphis Zoo in any way. 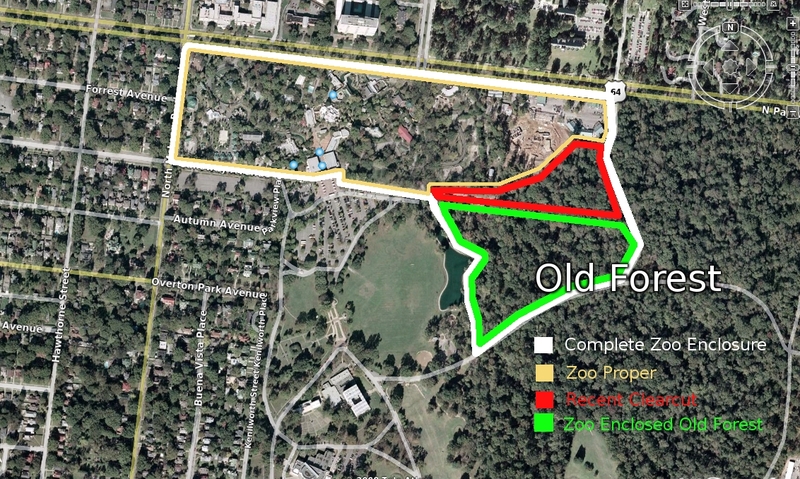 It would not prevent the zoo's proposed construction of a low-impact boardwalk in the 17 fenced-off acres of Old Forest; the zoo would simply need to consult with the City of Memphis and TDEC before construction. A number of SNAs in our region have elevated boardwalk trails, including the Ghost River and William B. Clark SNAs on the upper Wolf River. What types of development are permitted in SNAs by law? (A) Class I areas may be developed with foot trails, foot bridges, overlooks, primitive campgrounds and small picnic areas with associated sanitary facilities. Either class may be developed with such facilities as may be reasonably necessary for the dissemination of educational material and for the safe and proper management and protection of the area; provided, that no such facility shall be constructed or sited in such a manner as to be inconsistent with the preservation of the natural or scientific values in a Class II area or as an intrusion upon the scenic and recreational values in a Class I area." This year our booth is on the south side of Young, east of Cooper and just east of Blythe. Stop by and say hello, get a free sticker and a great t-shirt (for a $10 donation) and learn how you can help protect our great Old Forest. The Commercial Appeal has an excellent story and editorial about the Old Forest and Overton Park in their Sunday edition. Both recap the issues and conflicts over the future and integrity of the Park. Old Forest, old fight by Michael Kelley sunlights our goal to have the Old Forest permanently protected as a Tennessee State Natural Area and the Memphis Zoo's proposal to use a conservation easement instead. The editorial, Overton Park Suffers as Trust Lags, describes the two protection mechanisms (which CPOP considers to be compatible rather than competitive) but also talks about City Engineering's never-say-die attempts to build a detention pond/pit/dam/anything in the Overton Park Greensward, as well as the City's off-again threat to permanently winterize the golf course. The editorial concludes with a call for amicable and inclusive discussions over these issues. CPOP will always answer the call. 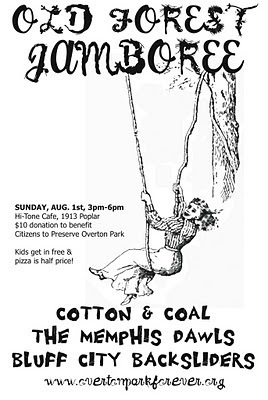 Sunday was our third semi-annual Old Forest Jamboree at the Hi Tone Cafe. 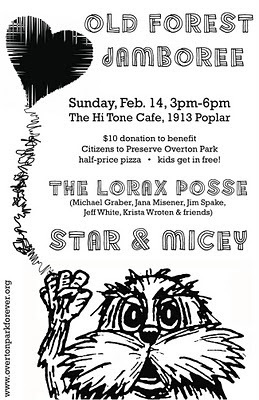 I was really excited to raise some money for the forest, eat Hi Tone pizza, drink a few Ghost River beers, hang out with friends, and listen to excellent local music. We had a great turnout and a great time despite the 105-degree heat wave. I finally got to see Cotton & Coal in concert, fronted by my good buddy and Rock-n-Romp cohort Caleb Sweazy. Next up we had the Memphis Dawls -- Jana Misener, Holly Cole, and Krista Wroten -- who are goddesses all. And finally, the superlative Bluff City Backsliders took the stage and showed their deep and abiding love for the Old Forest. I could have listened to them all night. Thanks to everyone who showed up to support our goal of permanent legal protection for Overton Park's old growth forest. Thanks to the bands who donated their time and talent, thanks to Ghost River Brewing for donating beer, and thanks to the Hi Tone Cafe for being awesome in every way. Y'all keep lifting us higher! Join us for a party at the fabulous Hi Tone Cafe! We'll have music from Cotton & Coal, the Memphis Dawls, and the Bluff City Backsliders. $10 donation at the door to benefit CPOP, kids are welcome at no charge, and the venue is smoke-free. Hi Tone pizza will be half price and grownups get a free Ghost River beer. Invite your friends and neighbors! We are thrilled to announce that the Old Forest of Overton Park has been accepted for listing on the Tennessee Landmark & Historic Tree Register, which is maintained by the Tennessee Urban Forestry Council. The purpose of this statewide registry is to "recognize noteworthy trees or groves of tree and acknowledge the significance selected individual trees or stands have had to communities, the State, and the nation." Last year, CPOP worked together with our friends at City of Memphis Park Services and Park Friends Inc. to nominate the Old Forest for this honor. You can download our application for more info. The Old Forest will be formally added to the registry in October. Evergreen Historic District Association For The Win! If you live in the Evergreen neighborhood, you should be very proud that your leaders are standing up for the integrity of Overton Park and speaking truth to power. It's been a busy spring and we've fallen behind in our blogging duties, so let's bring everyone up to date. 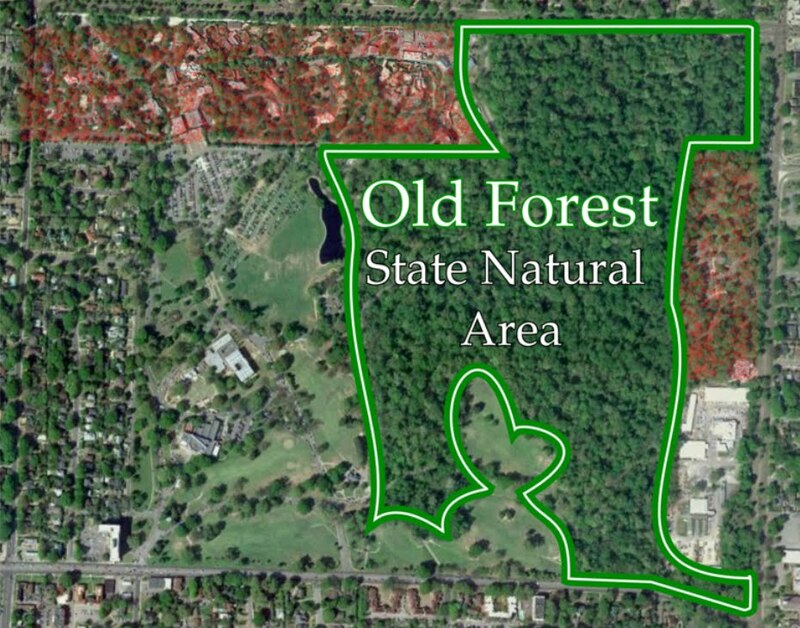 Earlier this year, the two Tennessee state legislators whose districts include Overton Park -- Rep. Jeanne Richardson and Sen. Beverly Marrero -- introduced a bill to designate the 150-acre Old Forest State Natural Area. 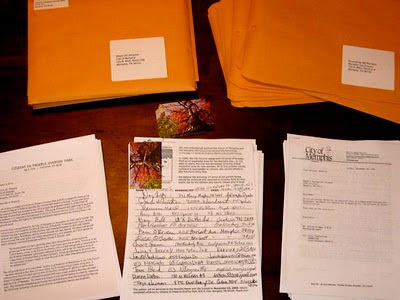 We asked you to write support letters to state legislators and Mayor Wharton. More than 200 forest-lovers did just that, because you're awesome. We also wrote a guest editorial on the topic, and the Memphis Zoo fired back. They called us liars (it's okay, that's just how Chuck Brady rolls) and issued a counter-proposal to protect the Old Forest with a private conservation easement rather than State Natural Area designation. Memphis Park Services worked with Zoo leaders to create a draft easement which we were allowed to comment on. You can download the draft easement [PDF] and our response [PDF] if you'd like to read along at home. We assume that public negotiations will continue on this topic. This is major progress from two years ago, when City and Zoo officials were not willing to acknowledge the need for any type of legal protection for the Old Forest. We're not on the same page yet, but at least we're all reading from the same book. Unfortunately, in a cruel blow to our newborn warm fuzzy feelings, a few of our City officials chose to attach a false fiscal note to the Old Forest State Natural Area legislation. This fiscal note claimed that the Old Forest SNA would cost the City more than $31 million dollars to implement. The City then issued a "corrected" version of this fiscal note claiming it would only cost $6.8 million or so. You can read the City's current fiscal note here. How much does it normally cost local governments to implement SNA designation? Not much. For example, check out SB 3872, a bill introduced by Sen. Jim Kyle this year, which designates the 225-acre Hill Forest State Natural Area in Nashville and adds acreage to an existing SNA. The City of Nashville said the cost of this was not significant and that's typical of SNA designations across the state. The Hill Forest State Natural Area was signed into law in March, but the Old Forest State Natural Area is still languishing in committee. And who can blame those committees? It'll cost Memphis more than six million dollars! Except that it won't. We sent a rebuttal to the City [PDF] in response to the original $31 million fiscal note [PDF] and those arguments apply to the current fiscal note as well. We received an encouraging response from Chief Administrative Officer George Little [PDF] but have heard nothing from the City officials who wrote the fiscal note. So, where do we stand now? The 2010 Tennessee legislative session is almost over. Our bill is dead. We are waiting to hear back from the City on our proposed changes to their draft conservation easement. At this point we think a strong conservation easement may be an appropriate way to protect the cultural and historic values of the entire 342-acre park. We also think the best (cheapest, easiest, most effective, most publicly transparent) way to protect Overton Park's irreplaceable old growth forest is by SNA designation. When the Old Forest State Natural Area bill gets reintroduced next year, we hope that our City officials will support it wholeheartedly. CPOP's "little old ladies in tennis shoes" had to fight City Hall for nearly 15 years before they saved Overton Park from being blasted apart by Interstate 40. We know our history and would prefer not to keep repeating it. Check out the University of Memphis alumni magazine for a great article on CPOP! "Stacey Greenberg and Jimmy Ogle are trying to make as big of an impression as possible while leaving the smallest of footprints behind. 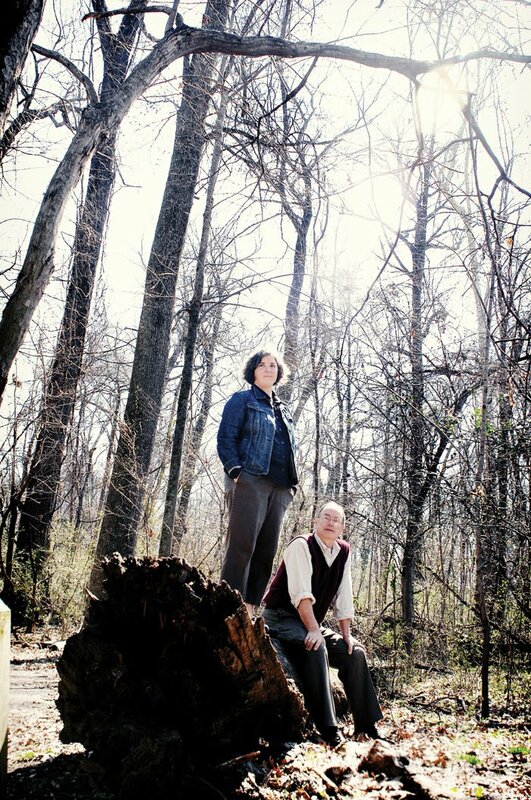 The two University of Memphis alumni are part of a grassroots effort to save a rare, virgin forest found in Memphis that is as old as the city itself." 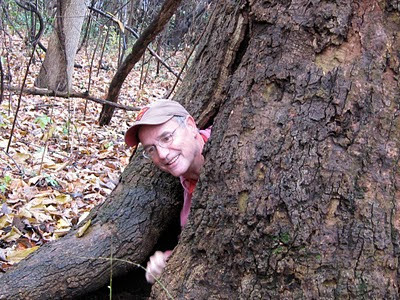 I was delighted to see Naomi Van Tol's March 19 Viewpoint guest column ("We deserve healthy forest, healthy zoo"), and I support completely the efforts of Citizens to Preserve Overton Park to enact the Old Forest State Natural Area bill to protect the Mid-South's last old-growth forest. As an environmental lawyer, I am aware that Memphis is not exactly on the cutting edge of environmental conservation, with a few notable exceptions. One example of environmental stewardship in our city is the Greater Memphis Greenline, which is in the process of converting approximately 7 miles of the old CSX railroad right-of-way into the Shelby Forest Greenline, a multiuse recreational path and park running from Midtown Memphis to Shelby Farms Park. And, out in Fayette County, in 1995, activists worked with the state of Tennessee to afford protection to more than 2,000 acres of the headwaters of the Wolf River with the designation of the Ghost River State Natural Area. The Old Forest State Natural Area bill is another great example of environmental protection at work in the Memphis area. The Old Forest is certainly worthy of legal protection. It is time for the Memphis Zoo to step up and support this legislation. Both the zoo and the Old Forest benefited from the grass-roots efforts of concerned citizens in the early 1970s, when CPOP successfully blocked a proposed extension of Interstate 40 through Overton Park. I hope the Memphis Zoo can recognize the value of the Old Forest by rising to this challenge to further its mission of preservation by working with CPOP and the citizens of Memphis to protect the Old Forest. Thank God for those rabble-rousing activist groups like Citizens to Preserve Overton Park and well-spoken and rational leaders like Naomi Van Tol. 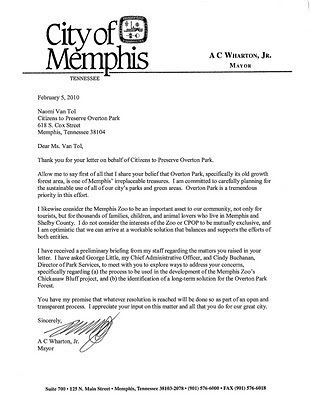 If not for CPOP and their predecessors, Memphis Zoo CEO Chuck Brady (March 24 Viewpoint guest column, "Conservation easement is right solution") would likely have no public park land to sequester since a (thankfully thwarted) highway would run through Overton Park. I encourage Brady to meet with CPOP, whose invitation he has rejected, and collaboratively work out a solution that allows the zoo to responsibly redevelop its attractions while granting protection to the remaining Old Forest and its diverse plant and animal inhabitants. Brady calls the currently unrestricted public forest "an exclusive area for a few citizens," though it's not quite clear how enclosing more park within the zoo boundaries and charging for access will make the forest less exclusive. Right now access to the Old Forest is free to "thousands of schoolchildren." Do they really need to pay to walk on a platform to experience the natural world? Indeed, access to the forest for people with disabilities is important, and I again encourage Brady to talk with CPOP to work toward responsible solutions to the issue. I am a zoo member and an Old Forest trail user, and I firmly believe that a solution can be found that is of benefit to all. Forest for the Trees from the Memphis Flyer. Natural Area Conversation from Park Friends Inc.
We strongly agree with PFI that the Greensward needs permanent protection, too. If we follow the Shelby Farms model of land preservation, as proposed last week by the Memphis Zoo, it would make perfect sense to create the 150-acre Old Forest State Natural Area and apply a conservation easement to all 342 acres of Overton Park. 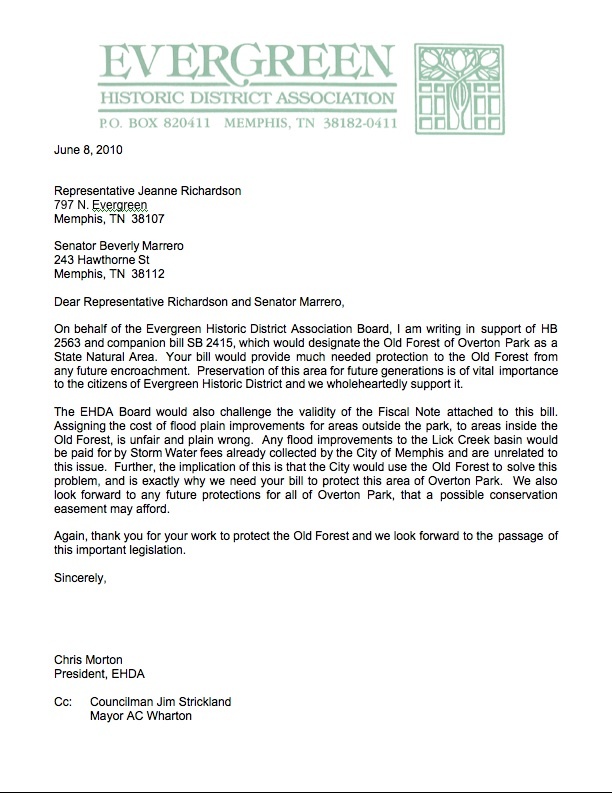 Last Friday we asked the Memphis Zoo to join us in supporting the Old Forest State Natural Area legislation. Today we have our answer from the Zoo's CEO/President Chuck Brady: Hell, no! I'm paraphrasing, but that's the gist of it. It's great that the Memphis Zoo has finally decided to support some type of legal protection for the Old Forest. We're making progress! It's not great that Mr. Brady keeps refusing to meet and talk with us. If he had talked with us first, maybe his editorial wouldn't have so many factual errors. 1. Mr. Brady says we are trying to restrict the public from using Overton Park. We do not propose any restrictions on any of the public recreational activities that are permitted at Overton Park today. The Natural Areas Preservation Act and its associated regulations do not require any restrictions on normal park activities such as running, biking, dog-walking, et cetera. Public activities could be restricted if the landowner chose to do so. But this is already the case at Overton Park. For example, a few years ago the City of Memphis decided to close the park to public use at night. 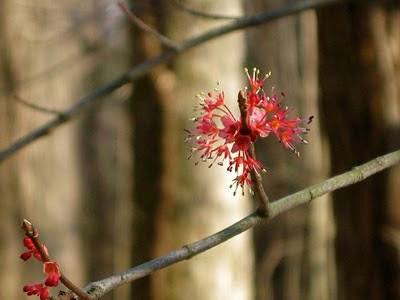 I happened to be working at Meeman-Shelby Forest State Park as a ranger/naturalist when 11,000 acres of that park became a State Natural Area in 2002. There was no significant change in the management or public use of the park. Recreational activities that are allowed in the Meeman-Shelby SNA include hiking, running, biking, hunting and fishing. Obviously this law is flexible and allows for a wide range of public uses. 2. Mr. Brady says that SNA designation would prohibit park maintenance. If by "maintenance" he means "bulldozing" then, yes, this is true. But this legislation would not change anything else about the way the Old Forest is currently maintained. Again, the City of Memphis could choose to restrict such activities in their management plan, but we see no reason why they would want to. 3. Mr. Brady says that Overton Park would be "controlled by the Nashville-based Tennessee Department of Environment and Conservation." In reality, this would be a cooperative partnership between TDEC and the City of Memphis. This partnership would only "control" the Old Forest; it would have no effect on any other part of Overton Park. 4. Mr. Brady suggests that CPOP views the Old Forest as an "exclusive area" that should be sealed in a bubble for our personal use. This is the opposite of everything our group stands for, as Mr. Brady would know if he had ever accepted our invitation to hike the Old Forest trails together. 5. Mr. Brady says the Old Forest State Natural Area would "effectively quarantine Overton Park's forest." It is laughably ironic that Mr. Brady would accuse us of wanting to quarantine the forest from the public, given his own devotion to barbed-wire fences. The publicly-owned forest inside the Zoo's fence has been completely closed to public access for 20 years. Even if the Zoo restores some degree of access by building the Chickasaw Bluffs boardwalk, the public will still be required to pay admission. Meanwhile, the rest of the Old Forest is free and open to the public 365 days a year. While we're on the topic of Chickasaw Bluffs, it's worth noting that the Zoo is advertising this proposed boardwalk using images of a 1,600-foot boardwalk that was built by the Nature Conservancy of Tennessee at the William B. Clark State Natural Area in 2001. A similar boardwalk was built by TDEC at the Ghost River State Natural Area in 2003. Clearly, boardwalks are compatible with SNA protection. 6. Mr. Brady lauds Shelby Farms as a shining example of how parkland should be protected, saying: "The governance of Shelby Farms is under a conservation easement, and this solution would allow Overton Park the same freedoms from which Shelby Farms benefits." He fails to mention that the forested portion of Shelby Farms has been a State Natural Area since 1988. If we followed the Shelby Farms model, as Mr. Brady suggests, we would create a State Natural Area to protect the forest and we would protect the entire park with a conservation easement overlay. Shelby Farms pays a substantial yearly fee to the Land Trust for Tennessee to administer their conservation easement. Shelby Farms is a sprawling area with a disparate array of land uses, including private commercial ventures. The Old Forest is just not that complicated. Our tax dollars pay for Memphis Park Services and TDEC's Natural Heritage program. In this case, is it really necessary to pay a private group to do what our public officials are already being paid to do? CPOP is not opposed to the idea of a conservation easement at Overton Park -- we just don't think it's the best solution. Our considered opinion is that State Natural Area designation is the cheapest, smartest, most effective, and most publicly transparent method of protecting the Old Forest from chainsaws and bulldozers. We look forward to continued discussion of these topics with the City of Memphis and anyone else who is willing to sit down and talk with us. 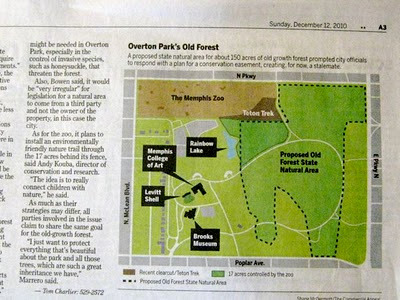 "We deserve healthy forest, healthy zoo"
Overton Park is the communal backyard of Midtown Memphis. Its institutions give us art, music and entertainment, and these things are important, but its natural spaces are essential. Ever since Overton Park was created in 1901, its peaceful fields and forest paths have given joy to generations of Memphians. Despite their immense value to our community, Overton Park's natural spaces lack legal protection. These spaces are often treated as "undeveloped land" when, in fact, they are fully developed as public parkland. Over the past century, the greatest threat to the forest and open space of Overton Park has been the expansion of the Memphis Zoo. We have lost 50 of the park's original 200 acres of forest. As recently as two years ago, the Memphis Zoo chose to clear-cut four acres of Overton Park's old-growth forest, without public notice, to build the Teton Trek exhibit. 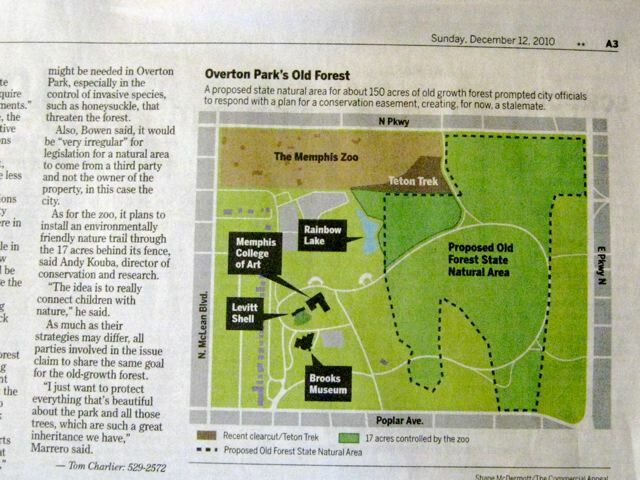 Citizens to Preserve Overton Park does not fault the Memphis Zoo for wanting to grow and improve. But its growth should not come at the expense of an irreplaceable 10,000-year-old forest ecosystem. We think our city deserves to have a healthy zoo and a healthy forest. That is why we are asking the Memphis Zoo to join us in supporting the Old Forest State Natural Area bill (SB 2415 and HB 2563) that was recently introduced in the Tennessee legislature by two of Memphis' Democratic lawmakers, Sen. Beverly Marrero and Rep. Jeanne Richardson. If passed, the bill would legally protect the 150-acre old-growth forest of Overton Park from inappropriate development under the provisions of the Natural Areas Preservation Act of 1971. This bill does not limit any of the public uses -- such as walking, running, biking and bird-watching -- that are currently allowed at Overton Park. The Memphis Zoo has a fenced expansion area containing 17 acres of old-growth forest that is slated for development as an exhibit called Chickasaw Bluffs. 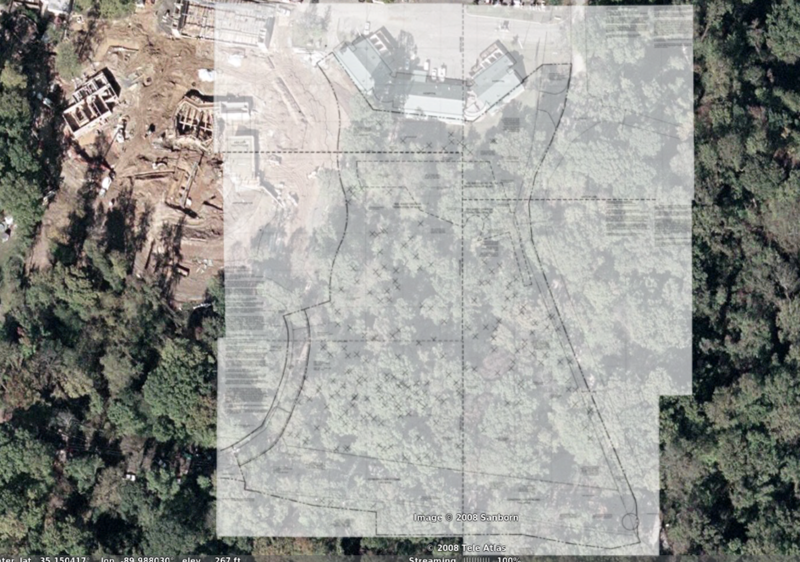 Zoo leaders say this exhibit will be limited to a low-impact boardwalk trail through the forest. This type of sensitive development would be permitted under the Natural Areas Preservation Act. Under the proposed law, the city of Memphis would work with the Tennessee Department of Environment and Conservation to develop a public management plan for the Old Forest State Natural Area. This plan would clearly define how the Old Forest is to be treated in future. The law provides for open citizen participation in the planning process. Many of our group's leaders and supporters are also members of the Memphis Zoo. We visit the zoo often with our children. We know that many of the zoo's older exhibits are badly in need of renovation or redevelopment. We believe it is time for zoo leaders to focus on improving the quality of their existing facility and stop expanding into the shrinking public spaces of Overton Park. Building pricey new exhibits while allowing older exhibits to crumble is not a sustainable growth policy. The Memphis Zoo does an excellent job of fundraising and attracting tourism to our city. But it is also heavily subsidized by Memphis taxpayers and heavily supported by local citizens who buy memberships and attend fundraising events. It is time for the Memphis Zoo to demonstrate a more positive and inclusive attitude toward our community. Given that the Memphis Zoo's mission emphasizes the vital importance of habitat conservation, we think it's a natural fit for zoo leaders to help protect the rich biodiversity of Overton Park. The Tennessee Ornithological Society has identified more than 160 bird species in the Old Forest, and Memphis Zoo researchers use the forest to study native snake populations and a rare species of purse-web spider. The city of Memphis recently funded and completed a 12-month botanical survey of the Old Forest that identified more than 330 plant species from 85 families. 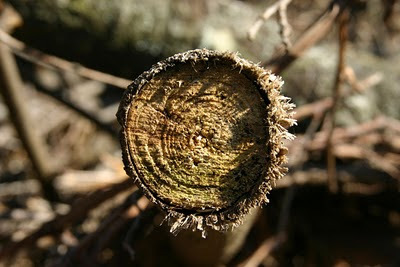 Many of the forest's larger trees are estimated to far exceed 200 years of age. This study concluded: "Overton Park's forest is a unique resource which cannot be replaced. It is invaluable to the city and to the region as an outstanding example of old growth forest. Because it is within an urban setting, it is even more exceptional. Everything possible should be done to assure that it is protected in perpetuity." We hope the Memphis Zoo and the city of Memphis will share our enthusiastic support for the Old Forest State Natural Area bill. 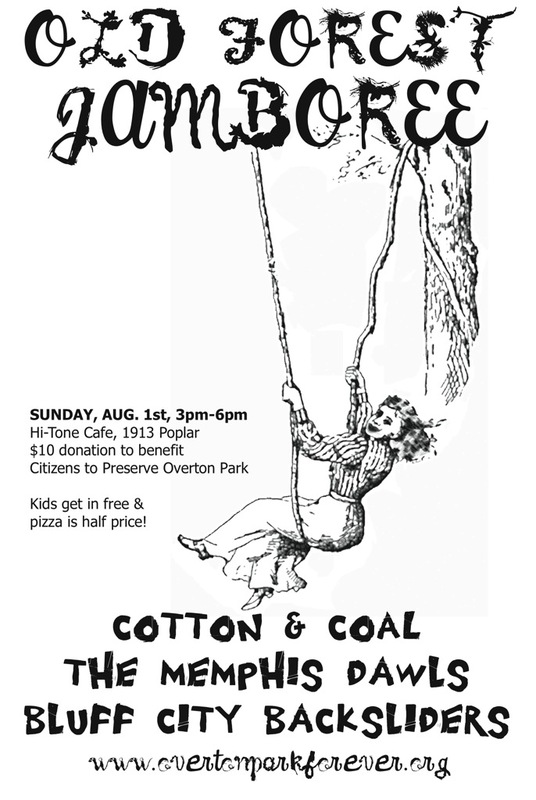 Let's work together to save the priceless old-growth forest of Overton Park for future generations to enjoy. For more information about Citizens to Preserve Overton Park, visit overtonparkforever.org, e-mail overtonparkforever@gmail.com or call 278-2396. Here's a guest post from our friend Elaine Blanchard, a wonderful storyteller, who read this piece at last month's Old Forest Jamboree. Thanks, Elaine! I grew up in Gainesville, Florida. We lived in town and next to Sweet Water Branch, a fabulous creek filled with tadpoles and crawdads. Elephant ears hung from the creek bank. Tall ferns were everywhere. There was a heavily wooded area, about the size of a city block, by the creek. That’s where my brother, Stanley, and I built our hut. That’s where we kept our treasures. That’s where we danced our wild dances and played goofy games. We belonged to the woods and the woods knew it. Our imaginations blossomed there – like wild flowers. Last year I went on a field trip with a group of fourth graders, urban kids who haven’t had opportunity to play in the woods. We took them to the Old Forest in Overton Park. On the way to the forest there was much speculation about horrible biting bugs, man-eating monsters, wild animals with sharp bloody teeth and mean men. Clearly the forest was a scary place in the minds of these fourth graders. Jimmy Ogle was our forest guide. Mr. Ogle met us at the bridge by the playground and began our outdoor adventure by sharing some of the park’s history. Overton Park was developed in 1901 and named for Judge John Overton, one of Memphis’ original founders. Our guide explained, as we walked along the path, that even dead trees are important in the forest as they feed the forest floor. 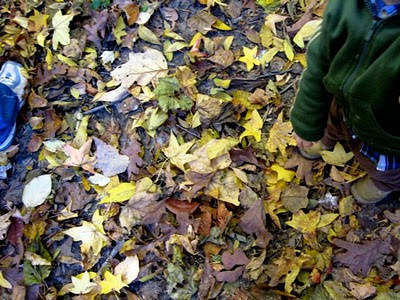 The children collected leaves: oak, magnolia, persimmon, pecan, tulip poplar, sweet gum. One child discovered a spider and every child swarmed to have a look. They were a happy bunch of kids as they discovered fungus, a gnome home, and grape vines to swing on. We learned about the canopy of trees and how smaller trees grow toward patches of sunlight. Arms were stretched around one huge tree trunk. It took one adult and three children to circle that tree! We saw birds take flight and nests of all sorts. At one point we all stood still and listened to the forest. As we listened, I could see in their ten-year-old faces that they heard their own names called. Hello, Emerald. Welcome, George. You belong here in this place of life, growth and mystery. You belong to the beauty here. On the way back to school there was no talk about man-eating monsters in the forest. The children had discovered a new classroom. A place to learn and grow. A place where even dead things are part of a rich life. 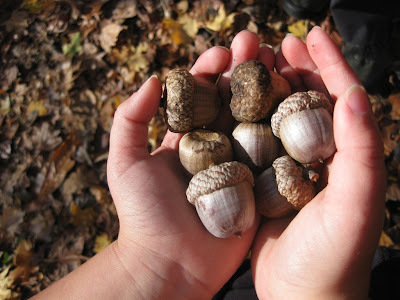 The Old Forest is intended for all of us and especially for our children. It’s a place where imaginations blossom like wild flowers. Join CPOP's next free public nature hike -- 10am, Saturday, March 13 -- as we search the Old Forest for the first signs of spring. We meet on the Lick Creek bridge at the east end of Old Forest Lane, next to the Rainbow Lake parking lot. Kids are always welcome. We hike rain or shine. Email naomi@spiny.com or call 901-278-2396 if you need more info. 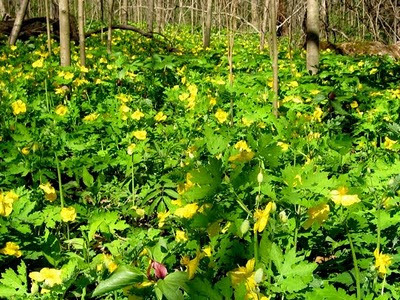 The Old Forest State Natural Area is our dream, but it won't become a reality without your help. Please call or write your state legislators today. This is a time-sensitive issue; don't wait! Ask your senator to support SB 2415 (Marrero) and ask your representative to support HB 2563 (Richardson). If Sen. Marrero or Rep. Richardson are your legislators, thank them for standing up for the Old Forest. If you live in Memphis, Mayor AC Wharton also needs to hear from you. This legislation would protect the 150-acre old growth forest of Overton Park from inappropriate development under the provisions of the Natural Areas Preservation Act of 1971 (T.C.A. 11-14-101). This legislation would not limit any of the public uses -- such as walking, running, biking, bird-watching, etc. -- that are currently allowed at Overton Park. If the Old Forest State Natural Area is created by our state legislature, the City of Memphis would work together with TDEC to develop a public management plan for the Old Forest. 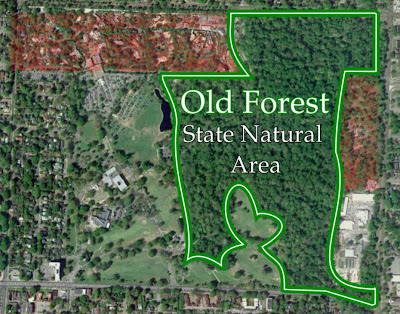 This plan would clearly define how the Old Forest is to be treated in future. The law provides for open citizen participation in the planning process. If you still have questions or would like a sample letter, please email Naomi. Thank you! I am wondering about the names of trees. Latin and Common. When I was a child walking in the woods, there were only trees. Skinny trees. Fat trees. Tall trees. Young trees. The word tree sufficed, can still suffice. Once I was walking through the woods with a friend – we were maybe eight or nine years old. He and I would spend long afternoons in the woods, climbing gully banks and following animal trails. For some reason, on this day my friend was carrying a hatchet, swinging it beside his leg as we were walking, and at some point in our walk he stopped beside a sapling and began hacking it down. I grabbed his arm and made him stop, and the outrage and anger that drove me to make him stop baffled me even then and baffles me now. Why would an eight year old boy care more about saving a sapling than relishing a chance to chop a tree – however small – down? I still don’t understand it. It seems to me I should have been eager to seize the hatchet and chop down the nearest vulnerably thin tree once he was finished. I didn’t know what kind of tree he was killing, and that kind of knowledge was irrelevant anyway. What mattered was that once destroyed, that tree would be forever destroyed. And lacking the power to create or renew life, it seemed an offense to kill or mangle a living thing. Yesterday we had our second annual Old Forest Jamboree at the fabulous Hi Tone Cafe. Last year, I thought we made it kid-friendly by having it start at 7pm on a Wednesday. While we did have a few kids in attendance, it was nothing compared to this year! Sunday afternoon from 3-6 (when there is no school on Monday) proved to be way more kid-friendly. In fact, I believe we had more kids in attendance than adults! Which, by the way, is awesome since CPOP's main objective is to preserve the forest for FUTURE generations. The Hi-Tone proved to be the perfect place for the Jamboree. We had a great stage and sound for our musicians, plenty of tables and chairs for our people, lots of room for our kids to run around in, and oh yeah, the best pizza in Memphis, half-price! Thank you, thank you, thank you, Hi Tone! We kicked off the festivities with a round (or two) of Ghost River Beer and the Lorax Posse. The Lorax Posse is a group of forest loving musicians who decided to get together and play some music for the first time ever! Ok, they did have one practice. I thought they sounded awesome and everyone seemed to be enjoying the music. Thanks to Mike Graber, Jana Misener, Krista Wroten, Jeff White, Jim Spake, and Jonathan Hart! Y'all gotta play more gigs! Next up we had the Old Forest monologues. Elaine Blanchard, Roy Barnes, Wendy Sumner Winter, and Steve Black each took the stage and shared their thoughts on our lovely 10,000 year old gem. (Of course only the front room could hear a word they were saying thanks to the two other rooms full of our enthusiastic, dare I say rowdy, next generation supporters!) Maybe we can get the transcripts up in the next few days. We ended the afternoon with an incredible set from the oh so talented and melodic Star & Micey. People were seriously going crazy over these guys. They are so good! And without really being LOUD. They were just perfect for a rowdy Jamboree. Go see them! It was one of the best Valentine's days I've ever had. Good times with good friends for a good cause. Can't beat that. Thanks to everyone who came out and made it such a success! We've got a big weekend coming up! 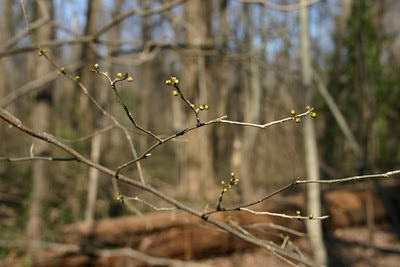 Join us at 10:00am tomorrow, Feb. 13, for our regular second Saturday nature hike. We meet next to the Rainbow Lake parking area for a free guided walk in the Old Forest. This Sunday, Feb. 14, is Valentine's Day and we're showing our love for the forest. Grab your friends and sweethearts and come on down to the Hi Tone Cafe from 3:00pm to 6:00pm for our second annual Old Forest Jamboree. Don't forget to become a fan of CPOP on Facebook! Yesterday, we received a reply from Mayor Wharton to our January 6 letter. We are very pleased by his fair-minded approach and commitment to transparency. As promised, the Old Forest botanical report has finally been released to the public! 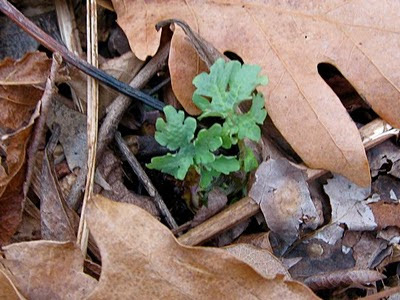 This plant survey was commissioned in 2008 by the Park Services division of the City of Memphis and was conducted over a 12-month period by a renowned local botanist, Tom Heineke. Overton Park Forest is a unique resource which cannot be replaced. It is invaluable to the city and to the region as an outstanding example of old growth forest. Because it is within an urban setting, it is even more exceptional. Everything possible should be done to assure that it is protected in perpetuity. This forest is indeed extraordinary and unequaled. Join us on Sunday, February 14, 3pm to 6pm, for a CPOP benefit at the fabulous Hi Tone Cafe! We'll have rockin' music, half-price Hi Tone pizza, and every grownup gets a free Ghost River beer. Kids are welcome and the venue is smoke-free. Big thanks to the Hi Tone management and our musical performers for their amazing generosity! Click the image to biggify. You know how we keep saying that Overton Park's old growth forest needs legal protection? It's time to get that done. Senator Beverly Marrero and Representative Jeanne Richardson -- the two Tennessee state legislators whose districts cover Overton Park -- just filed a bill to create the 150-acre Old Forest State Natural Area. Passage of this bill would save the Old Forest from future inappropriate development by placing it under the protective umbrella of the Natural Areas Preservation Act of 1971. It would be the first legal recognition of the value of this remarkable old growth forest. Tennessee currently has 80 State Natural Areas. Local examples include: the Lucius E. Burch State Natural Area which comprises one-fifth of Shelby Farms' acreage; the amazing bluffs and bottomlands of Meeman-Shelby Forest; the William B. Clark Conservation Area on the Wolf River at Rossville; the Ghost River State Natural Area on the Wolf River between LaGrange and Moscow; and the eagle and waterfowl refuge of Reelfoot Lake. We need to add the Old Forest to this list of protected public lands in West Tennessee. How can you help? Please contact your state legislators and ask them to support the designation of the Old Forest State Natural Area. The Senate bill number is SB2415 and the House of Representatives bill is HB2563. (You can read the bill online.) If you don't know who your legislators are, it's easy to find them here. If you live in Memphis, also take a minute to contact your City Council representatives and Mayor AC Wharton. Our elected officials need to know that the Old Forest has many friends. Please send us a copy of your message and send thank-you notes to Sen. Marrero and Rep. Richardson. Let them know you appreciate their strong leadership on this issue! We owe an immense debt to the brave CPOP founders who worked so hard to defend the forest from I-40 in the 1960s. We are grateful to them, and to our wonderful supporters, for inspiring this giant step forward. Now let's make it happen, y'all. Two of our supporters -- Jenn Allmon and Stephen Black -- recently began blogging the Old Forest in photos and poetry. If you love our forest too, you'll want to bookmark their blog! so many trees lie on their sides. I am writing on behalf of Citizens to Preserve Overton Park (CPOP), a nonprofit citizen group founded in March of 2008, to describe our concerns and request your help. As you may know, the original CPOP was founded in the 1950s to fight the proposed extension of Interstate 40 through Overton Park and Midtown Memphis. This group disbanded after achieving its goal with a landmark U.S. Supreme Court decision (Citizens to Preserve Overton Park v. Volpe) in 1971. We hope to further this legacy by obtaining permanent legal protection for Overton Park’s old growth forest. The old growth forest of Overton Park – known to generations of Memphians as the “Old Forest” – has been reduced to less than 150 acres today, but it remains a high-quality ecosystem. It contains more than 330 plant species from 85 families, including 60 species of native trees. 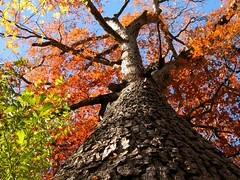 Many of its larger trees are estimated to exceed 200 years of age; meaning that they are older than the City of Memphis. The forest is an island of rich wildlife habitat in a heavily urbanized area. 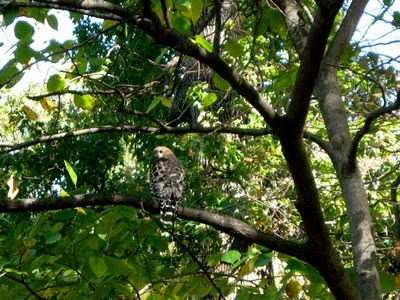 The Tennessee Ornithological Society has identified more than 160 bird species that use the Old Forest, including a diverse array of owls, woodpeckers, hawks, and songbirds. Despite its immense value as a natural and cultural resource, the Old Forest lacks any meaningful legal protection. Overton Park was listed on the National Register of Historic Places in 1979 and is included in the City’s Overton Park Historic District. However, these designations do not protect natural areas from being developed. There have been many threats to Overton Park’s integrity over the past century, but in recent years the greatest threat to its forest and open space has been the outward expansion of the Memphis Zoo. In 1988, a 20-year master plan for Overton Park was created at the behest of the now-defunct Memphis Park Commission. Under this plan the footprint of the Memphis Zoo was doubled from 36 to 70 acres. Thirty-four acres of Overton Park were fenced and closed to public use; at the time, approximately 25 acres of this fenced area was comprised of intact old growth forest. On December 30, 1994, the nonprofit Memphis Zoological Society was given legal authority to manage the 70-acre facility in a public-private partnership with the City of Memphis (see Contract #N10713, enclosed). In 2005, the Memphis Zoo clearcut several acres of old growth forest inside the 34-acre expansion area in order to build the Northwest Passage exhibit. 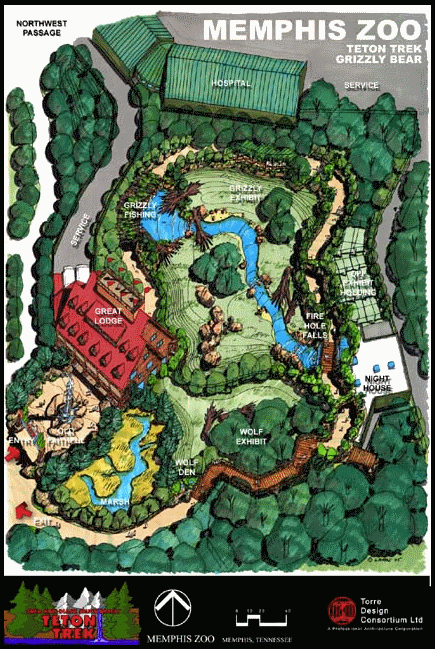 In February of 2008, the Memphis Zoo clearcut four acres of forest in order to build the Teton Trek exhibit. 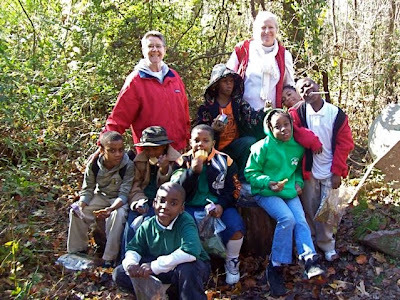 In May of 2009, the Memphis Zoo cleared and scraped two acres of forest understory, replacing thousands of native plants with mulch and sod, in order to create a picnic area. This permanent destruction and conversion of approximately eight acres of publicly owned old growth forest was done without any notice to citizens. 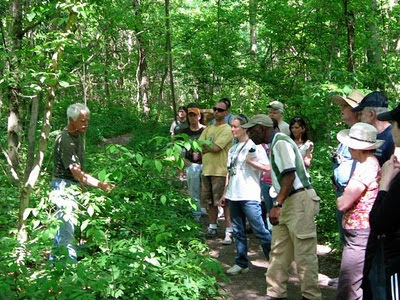 In the summer of 2008, the City of Memphis Park Services Division hired a botanist to perform the first comprehensive survey of the plant communities of the Old Forest. That survey was conducted over a 12-month period and is now complete. However, the Memphis Zoo refused to allow the botanist access to the 17 acres of surviving forest inside the fenced expansion area. A Memphis Zoo spokesperson told our group that the Zoo was conducting an in-house botanical survey, but, when asked for details, said the survey only included trees and non-native species. Those two categories represent less than 30% of the total plant species known to occur in the Old Forest. Currently the Memphis Zoo plans to develop the 17 acres into a new exhibit, called Chickasaw Bluffs, which would include an elevated boardwalk. The Zoo’s website says this new exhibit is intended to “educate our community of the forest's history and awe-inspiring beauty” (www.memphiszoo.org/chickasawbluffs). Given that the Zoo’s leaders chose to destroy eight adjoining acres of forest in the past five years, and recently would not permit a City-funded botanist to catalog the forest inside their fence, it is unclear how they are qualified to educate our community on this topic. Leaders of the Memphis Zoo have stated that an elevated boardwalk is needed to “make the forest accessible to the public.” However, the only part of Overton Park’s forest that is not freely accessible to the public is the 17 acres inside the Zoo’s expansion area. By erecting a fence around public parkland and requiring a typical family of four to pay $45 to enter, the Memphis Zoo made that parkland inaccessible for many Memphians. A boardwalk will not improve the current situation unless it is free to the public. In contrast, Overton Park’s unfenced forest contains an extensive network of public recreational paths (paved, gravel, and dirt) that are enjoyed by hundreds of people every day. Many of these paths have been in continuous public use for more than a century. We believe that Overton Park’s old growth forest is a community treasure that should be open to everyone. Therefore, it is our position that the 17 acres should be removed from the Memphis Zoo’s control and restored to the public realm. We recently gathered 600 signatures in support of this position. We do not fault the leaders of the Memphis Zoo for wanting to grow and improve, and many of our group’s leaders and supporters are also members of the Memphis Zoo. We simply believe it would be wiser to focus on improving the quality of the existing facility rather than continue to expand into the shrinking public spaces of Overton Park. It is apparent to any Memphis Zoo visitor that a large number of older exhibits are badly in need of renovation or redevelopment. Building expensive new exhibits while allowing older exhibits to crumble is not a sustainable growth policy. Our group has tried to discuss our concerns with the leaders of the Memphis Zoo. We were granted one meeting with CEO/President Chuck Brady, in May of 2008, but our subsequent requests to meet with Zoo representatives have been denied. 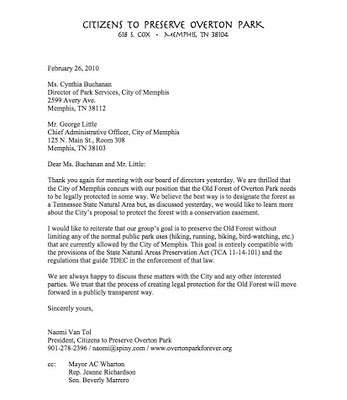 If the Memphis Zoo is permitted to move forward with the proposed Chickasaw Bluffs exhibit, we ask the City of Memphis to mandate the preservation of the forest’s ecological integrity during and after construction. We also ask the City to support the permanent preservation of the Old Forest of Overton Park by endorsing its legislative designation as a Tennessee State Natural Area. The Lucius E. Burch Jr. State Natural Area at Shelby Farms is an excellent local example of this method of preserving natural resources so they may be enjoyed by future generations. Thank you for your time and consideration of our requests. Please do not hesitate to contact me if you require more information, or if you would like to join our group for a nature walk in the Old Forest at any time.